Tina's Crop Shop: ICS Blog Hop - Technique Time! Hello and Welcome to the Inspire, Create & Share September Blog Hop! If you have already been hopping, then you know that this is a Technique Blog Hop! If you landed her from the Super Talented Claudia Perry's blog, thanks so much for continuing on! If you started with me, please make sure you click the next button as the end of the post for a lot of Technique Inspiration! There are honestly so many techniques that I love it was super hard for me to choose but I went with Emboss Resist and threw in a little extra twist with the Joseph's Coat Technique on the leaves! I love to use unexpected colors for Fall and Holiday cards so for this card, I did just that! I started with a 5 1/2" x 8 1/2" piece of Rich Razzleberry Cardstock, scored at 4 1/4". For my next layer, using Versamark Embossing Ink, I stamped a 5 1/4" x 4" piece of Whisper White cardstock with the Hardwood Stamp. 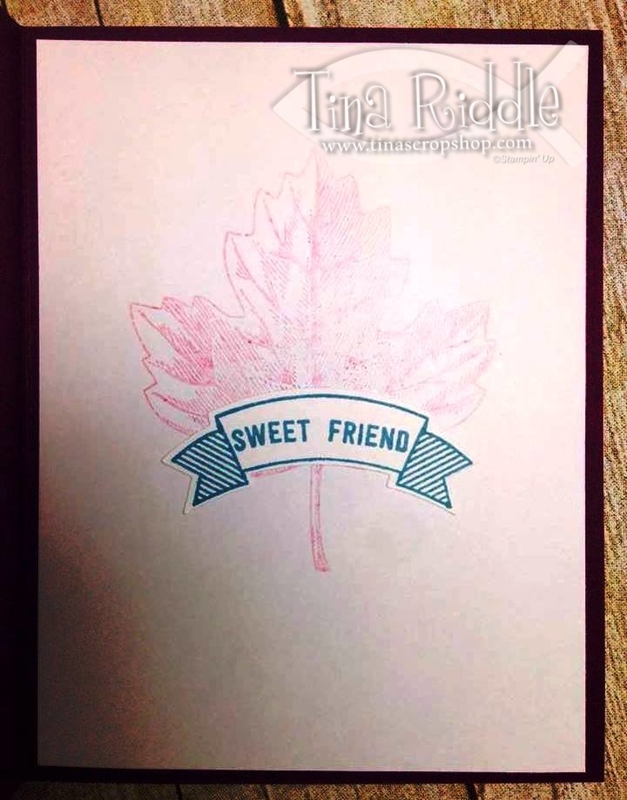 I then heat embossed it using Stampin' Up! White Embossing Powder. After the embossed image had cooled, I sponged on Soft Sky and Marina Mist, and Dapper Denim Ink onto the layer keeping the darkest inks toward the outside. After I sponged, I used a paper towel to rub off any ink that was on my white embossed image. Next for the Joseph's Coat technique on the leaves, I started sponging Marina Mist, Sweet Sugarplum, Rich Razzleberry and Dapper Denim onto scraps of Whisper White Cardstock in random sections and blending some of the inks together. 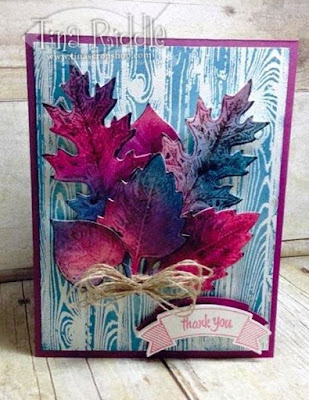 Next I clear embossed various leaves from the Vintage Leaves Stamp Set onto the sponged cardstock. Keep in mind that once you heat up the clear embossing powder, the images seem to disappear onto the sponged cardstock. Not to worry.. you will see them soon. Once the clear embossed images were cool, I used my brayer to apply Chocolate Chip Ink all over the cardstock... and then those beautiful leaves reappear! Yay! Once I had all my brayering finished, I allowed them to dry a bit and then cut them out using my Leaflet Framelits Dies. I then arranged them onto the front of my card and adhered with Stampin' Dimensionals. I made a big Linen Bow and attached it to the leaves stems with glue dots. Finally I stamped a Banner and sentiment from the Thoughtful Banners Stamp set in Sweet Sugarplum. I punched it out with the coordinating Duet Banner Punch and also Punched out the same Banner shape with Rich Razzleberry and attached it to the back of the sentiment with Fast Fuse. The entire Banner sentiment was attached with Dimensionals to the bottom right of my Emboss Resist Hardwood layer. For the inside I kept it pretty simple.. I stamped the Maple Leaf from the Vintage Leaves set in a stamped off Sweet Sugarplum so that it was a very light image. 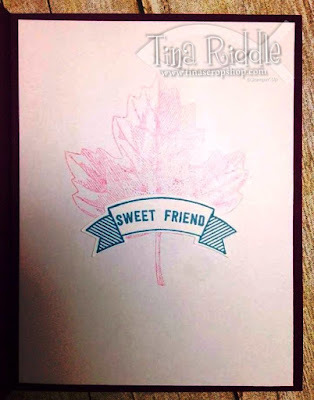 I stamped the Banner and Sweet Friend sentiment (also from Thoughtful Banners) in Marina Mist. I punched it out with the coordinating Duet Banner punch and used Fast Fuse to Add over the Light Leaf image. I hope you enjoyed the Emboss Resist and Joseph's Coat Technique and are ready to head over to the awesome blog of Tammy Dunlap for more technique inspiration. Just click the next button and you'll be there!